We have a couple of updates that we think should make you very happy! Wave 2 Shipping preparations underway! New Campaign, Three Little Wishes, Available Now! We're pretty close to the end! USA and the rest of the world - complete Friday/Saturday. We've unloaded 2 containers of the 4 we are receiving at the US warehouse, and have been informed that most of the UK containers have arrived at Battlefoam. Saturday (today) pickup confirmed at Gencon! Pledge Manager links now out! Quick addendum, the mail server is still sending out the emails as of 3:30pm EST 7th May. Surveys are for production estimates only. Don't worry if you made a mistake. This is a reminder that the surveys are for our production estimates only, and a pledge manager link will be coming soon to confirm everything and make additional payments. The Zombicide: Season 2 surveys are out! $2.25 million! See you in September! What a crazy total, beyond anyone's expectations surely! Mike unlocked! Thanks for a great campaign! $2 million baby! We're going crazy!! The GG and CMoN team are going a little nuts, so what better way then to top it all off with a crazy guy. 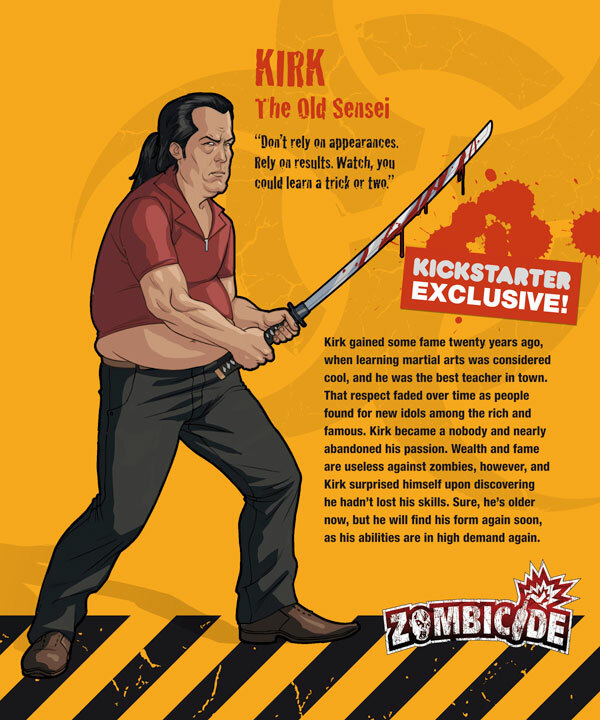 Most funded boardgame ever? Yes please! One day+ to go... can the Moustache Pack get us Smith? So, we've been getting requests from some of you to throw more optional stuff out there. Rather than nickel and dime everyone, here's 3 of them at once! These will ship in 2014 with the artist boxes - just wanted to clarify that. As we near the 72 hour reminder email mark, how about a real stretch? Here's a handy dandy list of everything this Season 2 campaign offers! And yes, we'll be updating the front page with this shortly for all the new backers. Going into last 3 days! Can you have too much free stuff? Apparently not, if we hit $1.6 million! 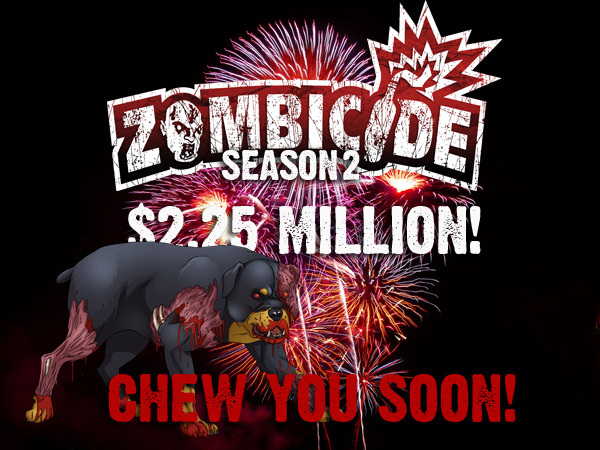 Achille should be joining us any moment now, so it's only fitting his zombie version finds brains even more delicious! 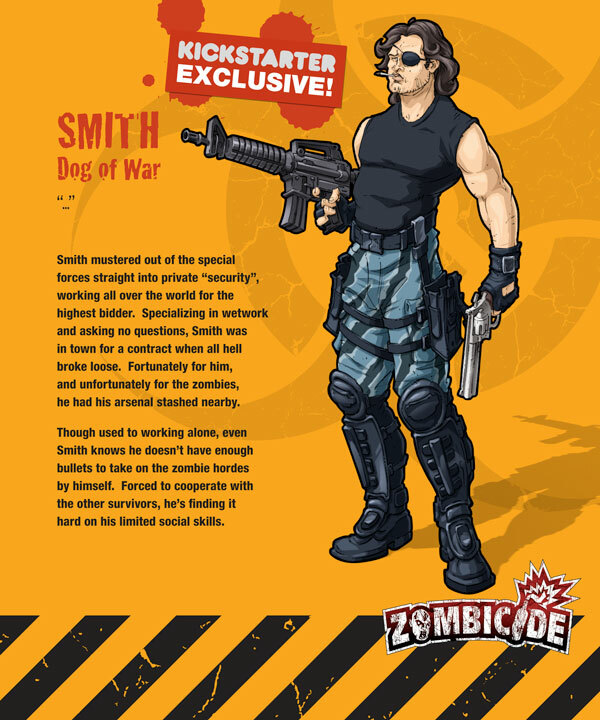 Guillotine Games has teamed up with some great comic book artist and game illustrators to bring you Survivors designed by the artists themselves! One week (and a bit) to go! Oops, looks like we were caught with our pants down and attracting lots of backers while we're busy working PAX East and GAMA (ok, it's not all work). A little over the halfway mark... two weeks to go! We'll be at GAMA and PAX this week promoting Zombicide Season 2 (of course), but fear not, PMs and such will still be answered as soon as we can. As we surpass Season 1 in backers (sweet, thanks for joining us), here's some more stretches to celebrate! Mini-update: The sculpting of Grindlock! Here's a timelapse video of the stages of sculpting for Grindlock, the heavy metal dude in Toxic City Mall. Be sure to view it in HD! $1 million! Ralph for everyone! That's pretty amazing, you've helped this project join the ranks of a rarefied few! Hope your Friday night is/was great! As we creep closer to breaking the magical $1 million mark (can we, can't we? ), it's stretch goal time again ladies and gentlemen! You asked for it, you got it. These new car designs will replace the vehicles in Prison Outbreak! Get ready to race around the streets! Wow, you don't want to be next to this guy... he gives a new meaning to bad gas! Get a free Toxic Fatty with this stretch! Ahh... doggies. Gotta love em and now you all get 6 companions! Pretty sweet indeed! So, what's next? ... or you will be, if we hit this stretch goal! Backer icons and avatars! 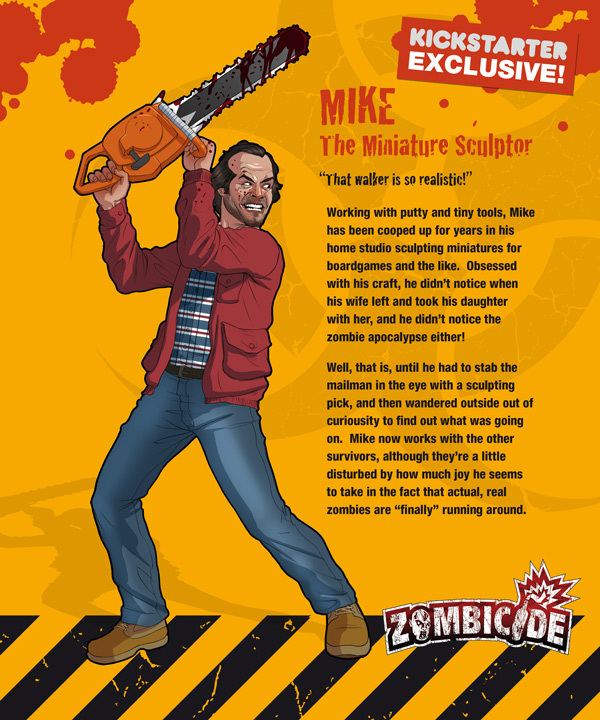 Show your Zombicide love! Remember when I told you to run...? These guys are bad news. Maybe this isn't really a bonus? MUAHAHAHHA! After three free stretches, it's time for an optional Survivor. 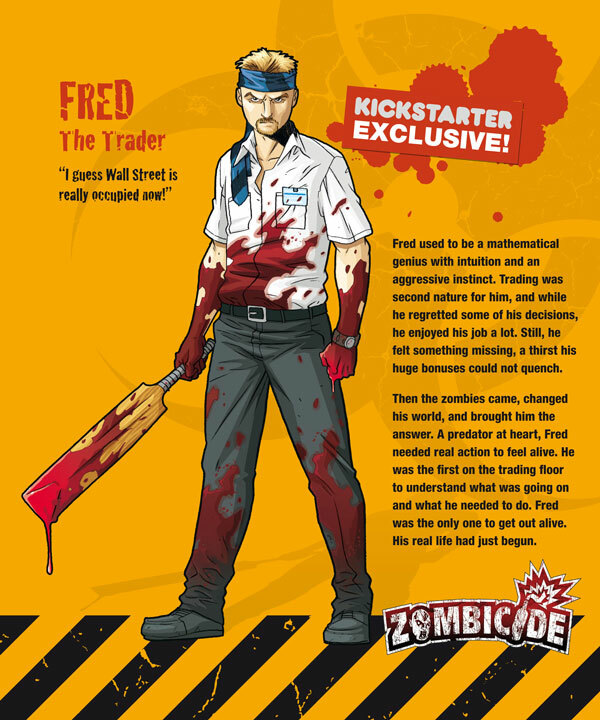 Next up, Fred! 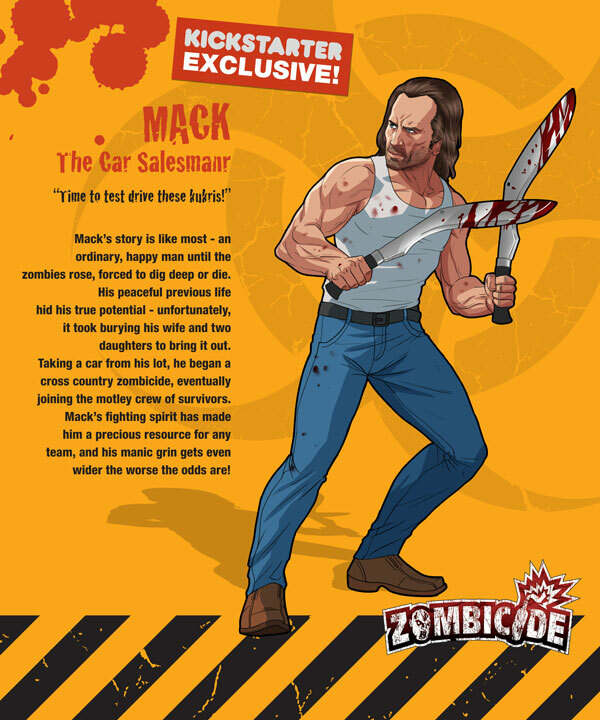 And of course, not forgetting his Zombivor counterpart, who really is dead! You can't have too many zombies... can you? Before we turn in... here's another stretch. Get 8 more bonus walkers at Inmate pledges and above! Good morning to all of you in Zombicide land! It's been a great 1st day so far knocking down these stretches! 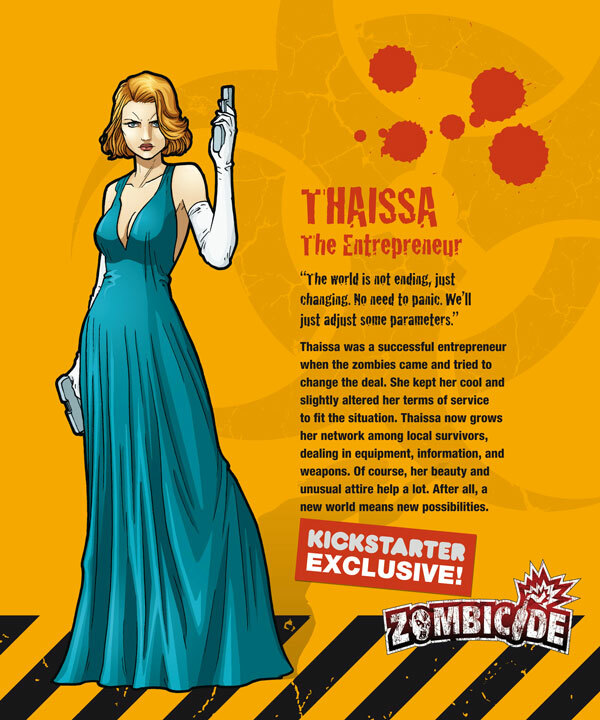 4 more stretch goals to tide you over, Thaissa will be joining us now on the Zombicide adventure! Thaissa is here to.. network! 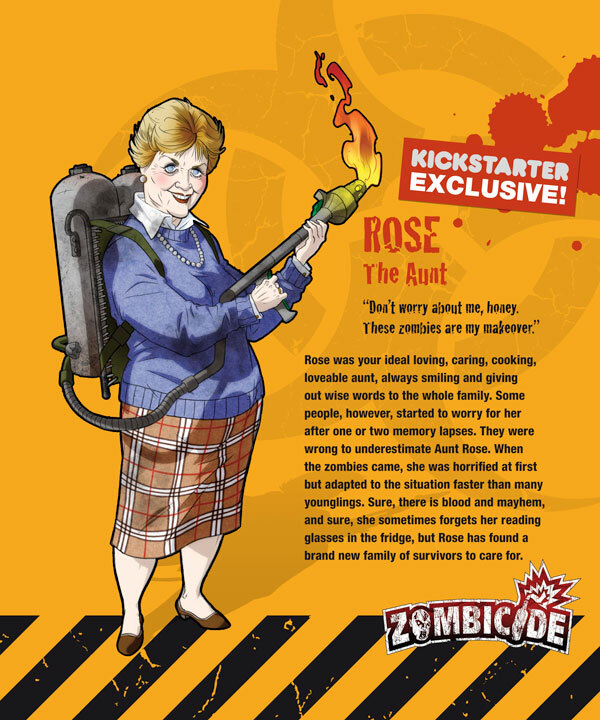 Woo... we're blowing through these stretch goals like Walkers!